The innodb storage engine supports foreign keys in Mysql. 1. Convert both tables into innodb, if they are not already. 2. 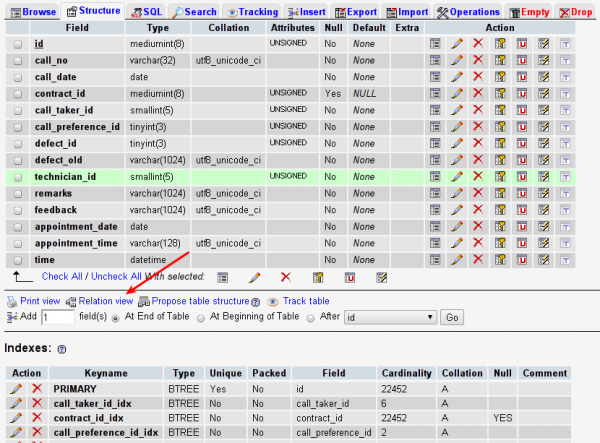 View the structure of the table which will have a foreign key. Make the referencing field an INDEX. 3. 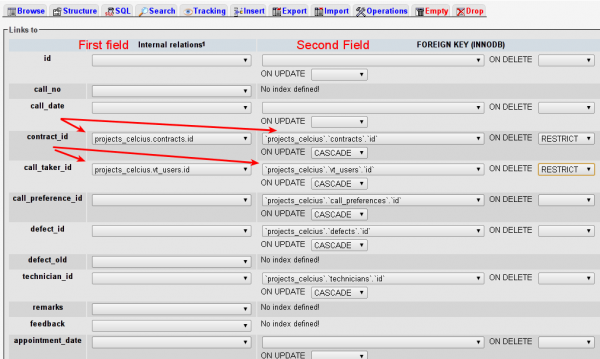 Now come back to structure view and click Relation view. In the Relation view page the field (which was made an INDEX) can be made a foreign key referencing to some other field in another table. Can you help me some problems. When I creat relationship between tables, It notice:Missing index on column. Why? And Must I do something to resolve them? Thanks,helpful, but how can i alter the change from create table sql statement. Thanks for helping us freely. I have seen your post but in my phpmyadmin the option like relation view and track table does not available only rest of two available i am new user of mysql please help me.. But I experienced that all my relations will be lost when I export and import the db. Do you know a way to keep this relations alive after a backup/restore process? If you use mysqldump then foreign keys are kept intact in the table definition. If you restore over existing tables (which dont have foreign key relation) then you need to drop tables so that fresh tables are created again with the correct foreign key relations. That’s what I was looking for. Now I can get associated models work together in CakePHP. Thanks! It ws really very useful…. Thanks. Clear and to the point.